Difficulty Comments: Elevation gain: 200-300 feet. Users have the option of one or more trail sections or loops. Much of the trail follows ridge tops and ridge rims with intermittent hills to climb throughout the trail system. Location: The main trail head is located 1 1/2 miles south of Hwy 12 on Piney Road on Townsend Ridge Road. An alternate trail head is located 2 miles south of Highway 12. The trail is open to hikers, mountain bikers and equestrians. *Note – The park staff may close the trail during exceptionally wet periods to help maintain it’s integrity. Please contact the park at 479-789-5000 for current status. Additional Trail Information: The Historic Van Winkle Trail is listed in the National Register of Historic Places. Description: The trail head parking lot, with restrooms, is located approximately 10 miles east of Rogers, AR, U.S. Hwy. 12. Walkers and Hikers can access historic area via tunnel under Hwy. 12. Interpretive sign panels describe the historic home and mill sites of the Peter Van Winkle family during and after the Civil War. Also, there is a beautiful stream, spring and raised garden site. Only some rock foundation stones remain of buildings. Guided tours available. NOTE: There is no access from this trail or its parking lot to the Hidden Diversity, Multi-Use trail. Description: This easy trail begins at the Visitor Center, on the east side. Parking is on the west side of the building. It is wheelchair accessible and meets ADA requirements. The trail has two different loops; an inner concrete surfaced quarter mile section, and an outer “challenge” loop which is crushed stone surfaced and one half mile around. Wayside panels inform visitors about the plants, animals, and geology of the area. An enlarged overlook area provides a view of a narrow hollow with a small spring and pools of water where wild critters come to drink. The trail winds around and through large pine and oak trees, and forest floor covered with various understory plants and wildflowers. Description: The trailhead parking lot is located on the north side of State 12, about 7/10 mile east of War Eagle Road (Benton County 98). There is a restroom that can be seen at the trail head. Park vehicles straight ahead off the highway, to the left of the gate. 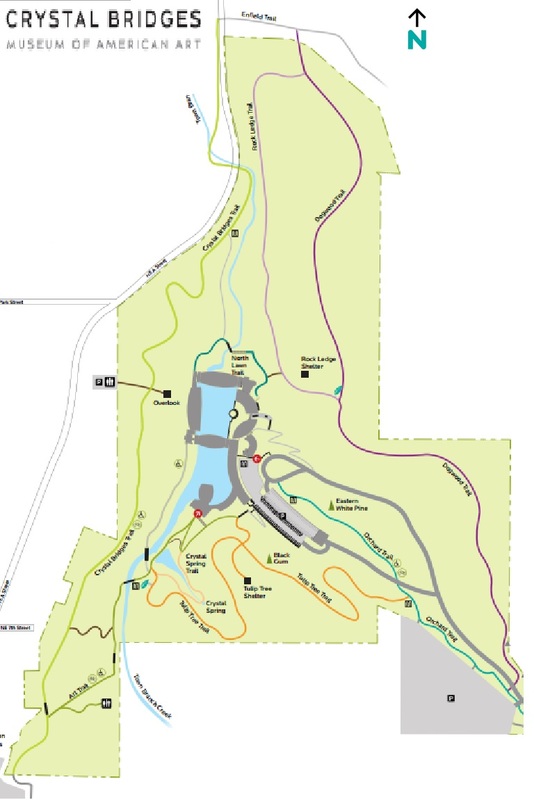 The trail is a double stacked-loop trail; there is a short loop of approximately 4 miles for day hiking and a longer loop of 8.5 miles for overnight use. 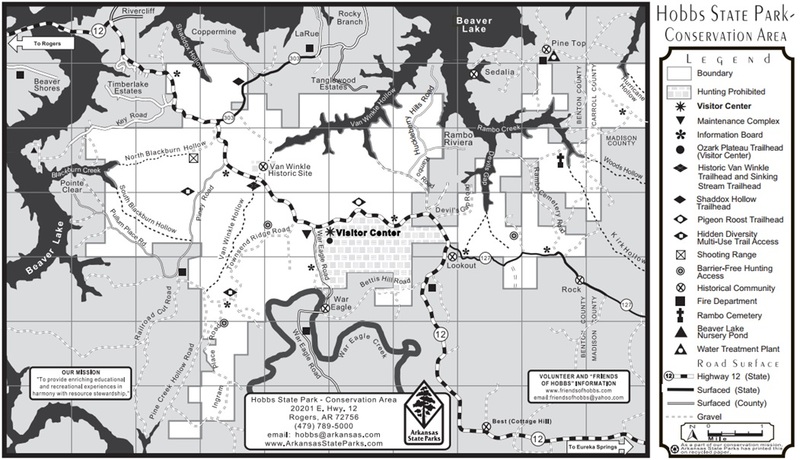 Primitive camping is allowed on the longer loop at five designated campsites only. These campsites, on a ridge overlooking Beaver Lake, are available on a first-come basis. Please contact the Ranger at the phone number listed below to determine if there will be a campsite available. The trail is fairly short for an overnight trail, but there are several hills to climb which give the trail its difficulty rating. From the parking lot, the trail begins straight ahead down the ridgeline. This is an access spur which follows the ridgeline for about 1/2 mile, then drops off the ridge to the west to the bottom of a hollow where it intersects with the loop. At this point, you can go either left or right; however, the hiking is a bit easier if you take the left fork. The trail winds through narrow hollows and up and along rugged ridges. It travels through stands of native pines, hardwoods, and typical Ozark vegetation. During leaf-off, there are several locations which offer great views of the Van Hollow branch of Beaver Lake. At present, small game and deer hunting is allowed in the area, seasonally, contact park office for more information. Guidebooks are available at most Northwest Arkansas outfitting and/or sporting goods stores. Description: The trailhead parking lot is located off Hwy. 303, approximately one mile from the intersection on the north side of Hwy. 12. The first 1/2 mile of this loop trail follows a ridgeline, providing an easy hike. The trail then descends into Shaddox Hollow. The descent is rather steep in places. The trail winds along the creek through stands of hardwoods and native Ozark vegetation. Some interesting limestone bluffs are found along this section. After progressing up the creek, the trail begins the climb back to the trailhead. This climb can be strenuous in places. Location: 11.6 miles east of Rogers , Arkansas , on Hwy 12 E.
Description: The trailhead shares the parking lot, restroom, and picnic tables with the Historic Van Winkle Trail on Hwy 12. This short and easy trail is a loop, upstream from the tunnels under Hwy 12. It goes up one side of Little Clifty Creek, crosses 3 bridges, then returns on the other side. It is natural surface, single track, for foot traffic only. The trail follows old level road beds, except for a couple hundred yards on west side hill. The upstream portion of the creek sinks under the rocks during dry spells, then re-emerges further on downstream. A nice spring on the west side runs all year. One of the three Scout bridges crosses this spring flow, just below some small beaver dams. Spring flowers abound here, before the large sycamore, oak, hickory trees, and spice bush, shade them out. Lots of birds, deer, and other wildlife love this area, and can be seen if you are quiet. The Art Trail features several outdoor sculptures, an amphitheater, and access to artist James Turrell’s Skyspace structure, The Way of Color. The Art Trail also connects the Museum’s south entrance to the Crystal Bridges Trail. This trail provides access to springs, and features many native plants, including cone flowers, American basket flowers, and black-eyed susans. Part of the City of Bentonville Trail System, Crystal Bridges Trail connects the Museum’s south entrance with downtown Bentonville via the Art Trail. The trail begins at NE 3rd street near the Downtown Square, and culminates at NE A Street at the northern edge of the Museum grounds, near the trailheads for Slaughter Pen Hollow. Crystal Bridges Trail features a beautiful walk through Compton Gardens, a mountain bike trail, and an overlook area where guests can view the Museum campus from the ridge above. The Crystal Spring Trail, accessible from the Museum’s South Lawn, takes visitors to the heart of Crystal Bridges’ grounds: the natural spring from which the Museum derives its name. Crystal Spring bubbles up from the Ozark limestone at the base of a ravine just a short walk from the Museum’s south entrance. The spring produces 100 to 125 gallons of fresh water per minute, at a chill 52 degrees year-round. It has been an important source of water for the area’s human and animal residents for more than 100 years. Pedestrian friendly, the Dogwood Trail features over 500 dogwood trees that flower during spring. 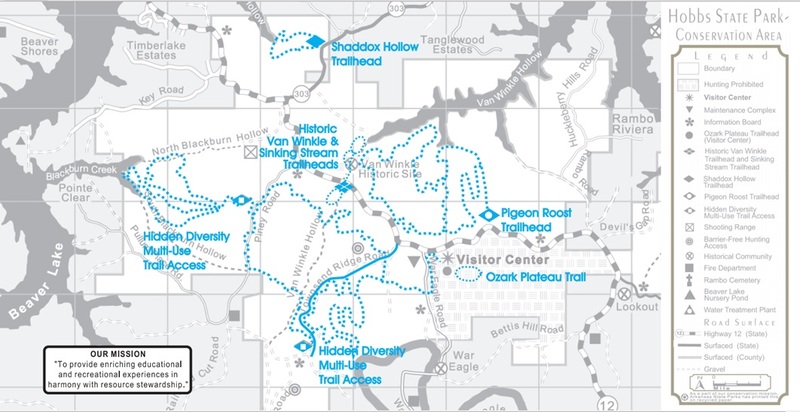 In addition to being the longest trail on Crystal Bridges property, the Dogwood features several natural seating areas carved out of the forest. This trail connects to the Rock Ledge Trail and to the City of Bentonville’s Enfield Trail. The Orchard Trail provides access to Crystal Bridges’ main entrance from Orchards Park and NE J Street. The trail features an evergreen forest made up of several species of pine trees as well as Eastern red cedars. This trail connects the Museum’s Additional Parking area with the main entrance, and also connects with the Tulip Tree and Dogwood Trails. The Rock Ledge Trail takes its name from the rock bluffs once carved into the hills to make way for a nineteenth-century railroad that was never completed. This soft surface, pedestrian-only trail overlooks several sculptures, the Museum’s north lawn, and the Crystal Bridges Trail below, and features large colonies of serviceberry and wild hydrangeas. Take a moment to rest at the Rock Ledge Shelter and enjoy the native plants and animals you may encounter. The Tulip Tree Trail features some of the largest trees on the Crystal Bridges grounds, and includes access to the Tulip Tree Shelter, which was fashioned from a scale mock-up of the Museum’s pine-beamed roof structure that was created during the design phase. Forming a loop from the Tulip Tree Trail, Crystal Spring Trail offers access to the natural spring for which the Museum was named. Tulip Tree Trail also provides access to the Art Trail and the Museum’s south lobby. Pea Ridge National Military Park contains 4,300 acres. Wild peas grew in such abundant in this area, that the first white settlers came to known it as Pea Ridge. This battle covered two day. A little over 400 men were killed outright, but any more died of their wounds during the following days, weeks and months. The total casualty count was around 3,400. The park’s hiking trail is seven miles long and goes through both natural and historic areas of the park. If you are not interested in hiking the entire trail there are several shorter loop trails, accessible from tour stop 7 (the Elkhorn Tavern). Many people enjoy walking and running along the tour road. We welcome this, but always keep an eye out for moving vehicles. Pets are welcome at Pea Ridge National Military Park, however they must be on a leash no longer than 6 feet at all times and are not allowed in any of the buildings unless they are service dogs. 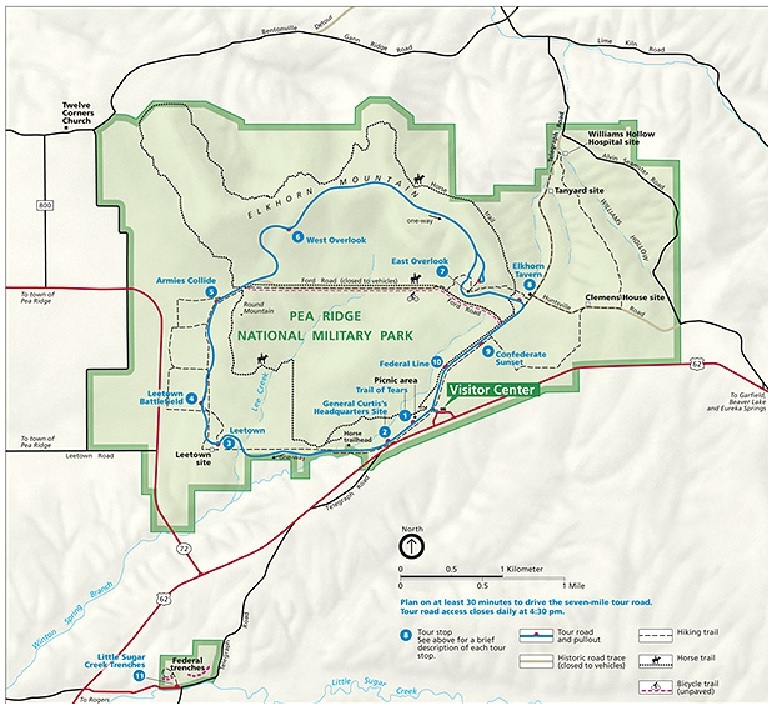 There is a fee to be on the Pea Ridge National Military Park, for any reason. This includes walking, hiking, biking, driving, horseback riding, touring the museum and watching the film. All tour groups must make arrangements with park staff at least two weeks prior to their arrival.